On August 2nd, 2015 from 9 am - 6pm, downtown Waverly, NY will have a huge festival filled with crafts, artisans, artwork, food, music and even an auction- a fundraiser for the Susquehanna River Archaeological Center, (SRAC) a non profit organization. Use the menu here to learn more! We at SRAC would like to thank all of the volunteers, vendors, participants for making 2015's event on Sunday August 2nd the biggest and best yet. The weather was great and the attendance was amazing, and we ended up raising over $6,000 for the SRAC museum. Thanks again to everyone who helped in whatever way they could and stay tuned for some great things that we have planned for next year! 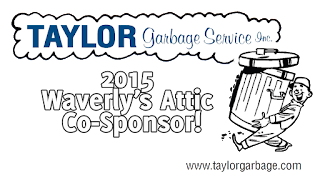 Waverly's Attic 2015 Gold Sponsor: First Citizens Community Bank! The Susquehanna River Archaeological Center (SRAC) is gearing up for their 3rd annual “Waverly’s Attic” street fair and auction from 9am to 5pm on on Sunday August 2nd. The event will include music, street vendors, food and refreshments, museum tours, a flea market, and what has become the most popular part of the event, a large auction. This year the auction itself has taken a twist in that it is not antiques being bid on but instead local business and big chain gift certificates, local business items, autographed memorabilia and even “bucket list” trips that are available by clicking on the “Online Auction” link above. (C)Copyright The Susquehanna River Archaeological Center (SRAC) 2015. All Rights Reserved. Website Design by TEAOGA Development, Waverly, NY.